Cryptozoic Entertainment, released two great games based on the cult TV show, Rick and Morty this year, and we’re going to recommend both of them for rabid fans of the Adult Swim mind-bending series. Rick and Morty: The Ricks Must Be Crazy Multiverse Game. In this engine-building tabletop game, 2-4 players take on the roles of Rick, Morty, Zeep, and Kyle as they introduce Power Supplies to different worlds, and then try to use the resulting Power to activate Contraptions before their opponents. Based on the Rick and Morty episode “The Ricks Must Be Crazy,” gameplay takes place in four “’Verses” with unique attributes: the Rickverse, Microverse, Miniverse, and Teenyverse. Rick and Morty: The Ricks Must Be Crazy Multiverse Game can be found almost anywhere games are sold for a suggested retail price of $20. Rick and Morty: The Pickle Rick Game is an intense 1-2 player game, based on the hugely popular “Pickle Rick” episode of Adult Swim’s Rick and Morty. One player plays as Pickle Rick as he tries to escape a heavily armed compound, while the other player takes on the roles of both the Russians and Jaguar as they try to stop him. The Pickle Rick player uses weapons cards to dole out damage and Air Vents to get out of jams as he or she tries to get to the Rooftop. 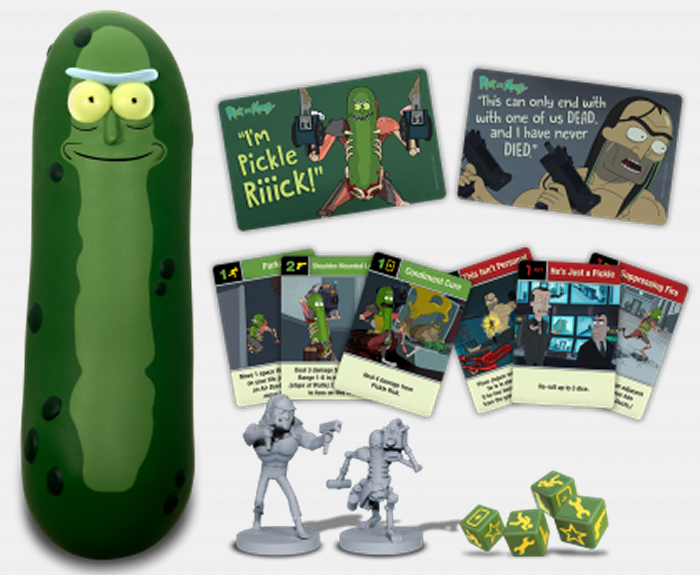 The game includes both Pickle Rick and Jaguar miniatures that are moved across a dynamic board made up of tiles that are constantly being added, rotated, and flipped. Adding to the off-the-wall fun is the game’s packaging: It looks like a pickle! The Pickle Rick Game is in stores now, and will run you between $30 and $35.